Junior Corenna Oeder works in the College’s Keyboard Lab. WILMINGTON — Wilmington College plans to debut a new minor this fall in which students will explore the intersection between creativity and communication. The music and media minor will combine courses covering music theory, music history, media and communications, with training in music, media technology and computer skills. Dr. Brianna Matzke, assistant professor of music, said this type of academic program, which is rare at smaller schools, gives students another opportunity to enhance their employability by learning skills that would complement majors such as communication arts and marketing. The technical side could be especially advantageous when producing audio clips for social media, background music in videos or even creating theme songs for radio shows. The timing of the new minor coincides with this semester’s debut of Quake Radio, a campus radio station that is expanding opportunities for all facets of the broadcast medium. Matzke said the timing of the minor dovetails well with the presence on campus of faculty members whose areas of expertise lend itself to music and media. Indeed, the aforementioned Quake Radio is largely the brainchild of a new communication arts faculty member, Nick Wiget, while an adjunct faculty member, Chip Murdock, teaches a course in audio production. Add Matzke and new instructor Stephen Wadsack on the music faculty and Dr. Corey Cockerill in communication arts and the teaching component for the minor is already in place. Most courses already exist, however this fall’s Music Technology class will premiere as a key component in the music and media curriculum. Required courses also are Music in Human Society, Music Theory, Mass Media in Global Society and Communication Theory and Thought, while electives include Broadcast Media, Topics in Communication Arts, Public and Media Relations, Social Media Management, Topics in Music and such musical performance courses as the College Chorale, Quaker Thunder Pep Band and private lessons. 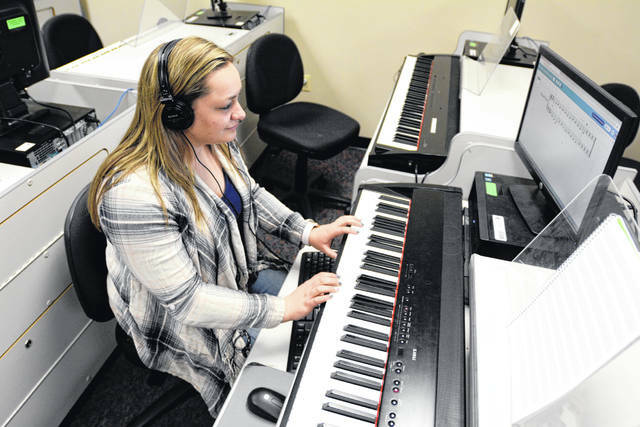 https://www.wnewsj.com/wp-content/uploads/sites/22/2019/04/web1_KeyboardLab.jpgJunior Corenna Oeder works in the College’s Keyboard Lab.